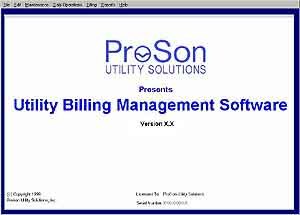 This utility billing management system (UBMS) is a utility billing system for small to moderately sized water, gas, and electric utilities. The system, designed for Windows 95/98/NT, allows the utility to collect meter readings manually or with a hand held computer and offers over 45 standard management reports. Use the main menu to access all functions within the system. The menu has been designed for ease of use and simplicity of operation. The company information screen is where users assign all information about their company and set up the defaults that are used throughout the system. Defaults allow users to set up common data elements once; then anywhere they are used in the system, the default value is placed in that field. However, these items may be changed on an individual basis whenever the user requires. All items are available on one screen by simply selecting a tab. Tabs available on the company information screen are miscellaneous, bill messages, user defined charges, user defined fees, and rates and taxes. The account information screen allows the user to add, edit, delete, or view all the information necessary for each customer. As with the company information screen, all information for the customer is available on one screen by selecting a tab. Available tabs include special instructions, history information, charges, notes, usage, deposits, meter information, rates and taxes, other charges, and current payments. ProSon Utility Solutions, 355 Elmira Rd. N., Suite 104, Richardson, TX 75081. Tel: 972-480-8300; Fax: 972-235-8556.